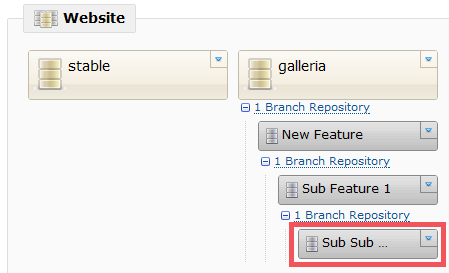 There was a recent question over on the Kiln Knowledge Exchange about why when you started to nest branch repositories deeply, the UI didn’t scale to support long repository names. I had a wry smile on my face when I answered that question because this particular decision was the topic of a few hours worth of discussion over the course of Kiln’s development. With so many choices, how the heck do I know which branch is the “right one” for my code? The moment I hesitate like this when I am trying to get work done, I start thinking about ways to “get around” the problem because, well, I don’t have time for my tools to make my job harder. What’s the least we can do, and still satisfy our goals? In the end, I think we came up with a good solution. We didn’t gimp a user’s ability to experiment, but the UI certainly doesn’t encourage people to use deeply nested repositories. And for the people that really need them, there are some workarounds (like using Greasemonkey). The good news is that, based on the feedback we’ve gotten so far, it’s working pretty well. Most users aren’t getting sucked in by the lure of deeply nested repositories. And, we didn’t spend a bunch of time up front trying to get the UI to support it, which means we were able to spend our time on things that people were going to run into every day.